What more could you want? 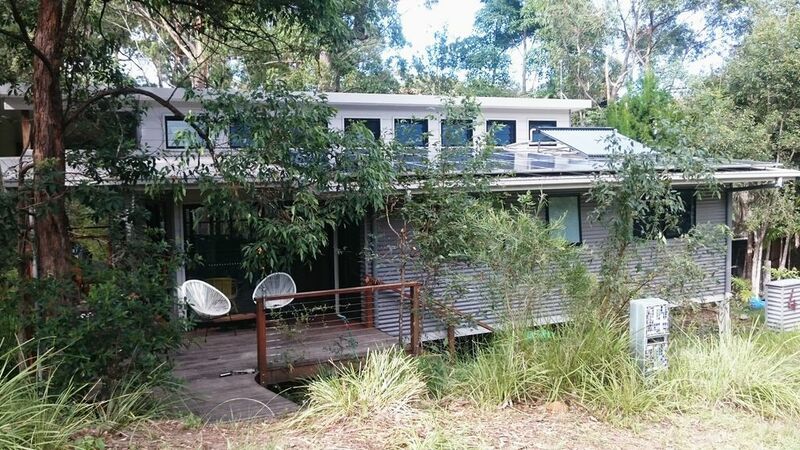 A stunning environmentally designed solar passive home in a bush setting; fall asleep to the sound of the ocean, hear the kookaburras, see the visiting kangaroos, echidna, goannas, parrots and tawny frogmouths from the large wraparound deck. Always a place in the shade or the sun to sit, relax, read a book or drink a favourite tipple. Three ample sized queen bedrooms with comfortable mattresses, one with an ensuite and separate entrance, the two bedrooms upstairs share a bathroom with a large walk in shower and a bath. The house makes an ideal location for grown up gatherings, family meet ups or a quiet wind-down from urban life. A beautiful kitchen with ample amenities, large fridge, dishwasher, induction cooktop and fan oven to cook or use the Beefeater barbeque on the deck. Two nature trails lead through the bush down to Deep Creek estuary and the beach, a haven for swimmers, sunbathers and fisherfolk ( just five minutes walk from the house). The house uses tank water but there is a drinking water spigot in the kitchen for town water. Wash off salt and sand in an outside shower downstairs. House is very well insulated but in Winter you can use the woodburner to quickly heat up the house which will retain heat well. Woodheater with hardwood supplied in Winter months. Bush garden with native plants and a few fruit trees, many visitors to the garden, kangaroos, goannas, lorikeets, parrots, water dragons, echidna and tawny frogmouths! Lovely house great setting backing onto the reserve lots of birds and wildlife. The house has everything you could want. Thank you Linda. So glad you enjoyed the bush setting. We love watching the kangaroos and other passing wildlife too! My family enjoyed a lovely two days in this beautiful home in a wonderful bush setting. The home is very well presented with everything you could want. It’s a very comfortable passive solar home. Every detail has been considered and catered for including books games crockery cutlery (even for babies) and excellent cooking supplies. There is a pumice stone in the bathroom too. Thank you Marjorie for your kind words. We're so glad you enjoyed your stay and if there's another golf game in the offing that you'll choose our home! We enjoyed our stay at the property, it was extremely comfortable with all that you need. It was great to have some board games there too which we had fun playing together! We're glad you had a great stay. You're welcome back any time! Thanks for your comments. We certainly had some unusually cold weather the week your family were here and we will certainly take on board that the downstairs bedroom might need some heating. I'm glad you found everything else wonderful. Lovely house, we really enjoyed our stay and exploring the surrounding area. Glad you enjoyed your stay in lively Valla Beach! Peaceful setting with close proximity to the estuary for canoeing, the beach and lagoon for swimming and relaxing with easy access to local towns, Nambucca Heads, Macksville and 30mins to Coffs Harbour or Bellingen. Easy drive to the Dorrigo Plateau National Park. Wonderful Nyambaga Walking Trail in Nambucca showcasing bush tucker and aboriginal history.